IT has been three and a half years since First Minister Peter Robinson described Northern Ireland’s education system as a “benign form of apartheid which is fundamentally damaging to our society”. He said then that consideration should be given to tasking a body or commission to bring forward recommendations for a staged process of integration. The Detail provided strong evidence of the segregated nature of our school system in November 2012 when we published figures showing the religious make up of every primary and post-primary school here. Our investigation found that almost half of Northern Ireland’s schoolchildren were being taught in schools where 95% or more of the pupils were of the same religion. In the 2011/12 academic year 180 schools had no Protestant pupils on their rolls and another 111 schools taught no Catholic children. Teachers also continue to be trained separately in Northern Ireland with Stranmillis University College training staff for the state sector and St Mary’s University College preparing teachers for Catholic maintained schools. Integrated schools bring children and staff from Catholic and Protestant traditions, as well as those of other faiths, or none, together in one school. 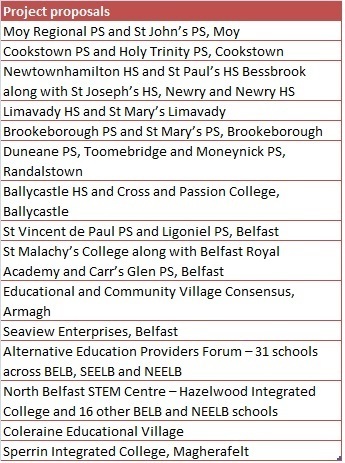 There are currently 62 integrated schools in Northern Ireland educating over 21,000 children. However, since the landmark apartheid speech of 2010, the government’s focus and language has changed. The desire to fully integrate Catholic and Protestant children in schools has been replaced by an acceptance that many schools remain separate and so instead they are being encouraged to “share” – classes, facilities, teachers and even buildings. Integrated education purists say this isn’t radical enough – while others claim it is a more realistic option for the here and now and may even lead to fully integrated schools in some areas in the future. On 19 July 2012 the Minister of Education established a Ministerial Advisory Group on advancing shared education and its report was published in April 2013. Northern Ireland’s Shared Education Campus Programme was launched as part of the Executive’s ‘Together building a United Community’ initiative announced by the First and Deputy First Ministers in May 2013. This included that work on 10 shared education campuses would begin within the next five years. Proposals for these “pathfinder projects” had to be submitted by the end of March 2014 with an announcement due on the successful applications this month. It was announced in April that 15 expressions of interest had been submitted – ranging from shared sports facilities to joint school campus models. 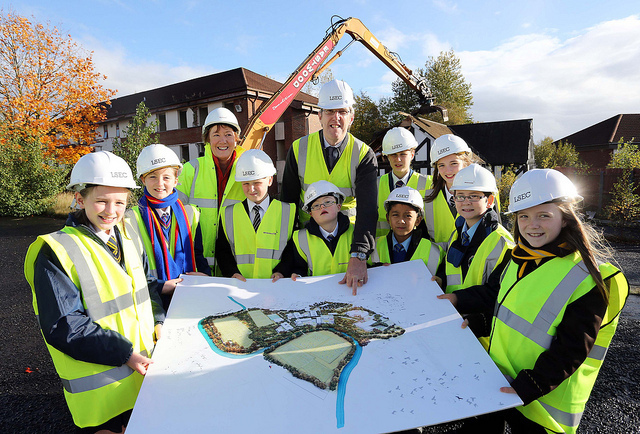 Mr O’Dowd said it is anticipated that work will begin on the construction of the campuses by 2016. All of the proposals are listed below. Education Minister John O’Dowd has described the Lisanelly Shared Education Campus based on a former army site in Omagh as “a game-changer in terms of how we plan education”. It is a shared campus in the truest sense of the term – bringing together six schools of different management types and phases onto a site of more than 130 acres with a forecast combined long term enrolment of around 3,700 pupils. Phase one of the building work for the project got under way in October 2013 with construction costs estimated to go over £120m. Partly as a result of these cost implications, the Department of Education’s Shared Education Campuses Protocol warns that the Lisanelly Shared Education Campus should be recognised as unique. The 15 proposals currently being considered by the Department of Education include a proposal for two primary schools in Moy. Catholic St John’s Primary and Moy Regional (mainly Protestant) primary have put forward a plan to share a school building but would keep their own identities, separate school uniforms and be based in different wings of the building. Armagh Educational Village is a proposal to locate selective and non-selective schools from the controlled, voluntary grammar, Catholic maintained sectors on one site in Armagh and incorporate the campuses of the Southern Regional College. HOW MUCH SHARING IS HAPPENING NOW? The School Omnibus Survey is designed to collect a range of information for the Department of Education’s policy teams. Questions were issued to school principals in March 2013 covering seven issues – one of which was shared education. A total of 569 responses were received for the shared education questions from primary, post-primary and special schools. This equates to 52% of all schools. Of the respondents, 76% said that their school had been involved in shared education with another school in the last academic year. Participation was higher in post-primary schools (94%) than in primary (71%). Of all the principals who replied to the web-based survey, only 306 (54%) said their pupils had been involved in a cross-community partnership with another school while 43% said their sharing had been with a school from the same sector. The principals could choose more than one answer in response to this question. The activities schools took part in were curricular and extra-curricular and included joint projects, shared facilities (including sports facilities), shared teachers, shared equipment (like minibuses and computers) and shared classes. Activities also took place outside of the schools – for example in outdoor activity centres, churches and cultural venues. For those involved in partnerships, 59 principals said it only involved one class, 337 said more than one class and in 71 cases it was at whole school level. Costs for schools included transport, substitute teacher cover and venue and equipment hire with funding coming from Department of Education earmarked funds, school budgets and external funding. Disadvantages were identified by 285 principals, while 284 said there were no disadvantages. Ninety-three principals said cost was a disadvantage. Other issues include disruption to classes, lost teaching time, time spent travelling and bureaucracy. What the survey does not tell us is how focused the sharing was for these schools. We do not know how many schools just participated in a single joint school activity on one day – possibly involving one class. Or how many were at the other end of the scale with school principals from different schools regularly meeting and planning together for a series of joint classes and activities. The interactive map below shows the segregation currently within our school system. The Fermanagh Shared Education Programme helps to develop links between schools from different sectors, creating the potential for joint working, sharing and collaboration. Funded by the International Fund for Ireland and Atlantic Philanthropies, the programme provides funding to schools in the county to deliver part of their curriculum jointly with another local school on a cross-community basis. Brookeborough Shared Education Campus is one of the proposals from Fermanagh currently being considered by the Department of Education and would involve a new shared education campus built on a neutral site in Brookeborough to accommodate St Mary’s Primary School and Brookeborough Primary School. The campus would include cross-community playgroup The Playstation. Each school and playgroup would retain its own separate ethos and identity and the campus would also be open for local community use. The proposal has been endorsed by the Council for Catholic Maintained Schools and the Western Education Board and would build on cross-community work already taking place between the two schools. Lauri McCusker, from the Fermanagh Trust, said: “We have been working on shared education programmes in Fermanagh since 2007/8 so we are very keen to see shared education mainstreamed. “The shared education commitments in the Programme for Government appear to be being implemented with the ministerial group report and now the impending announcement on putting resources behind the other commitments. We welcome this and know that it will have a huge impact. “In Fermanagh we now have schools working together that traditionally would seldom or never have worked together. They are planning together, working on the curriculum together and sharing resources. Relationships are building. “Shared education brings people on a journey of working together and different models will work in different areas. In many areas where there are minority and large majority communities it is not realistic to have one integrated school. The history across this island shows that to be the case. Fully integrated schools must remain on the agenda. This was stressed last month when the legal requirement on the Department of Education to “encourage and facilitate the development of integrated education” was highlighted during a High Court case in Belfast. The judgment was related to the approach taken by the department to a development proposal submitted by Drumragh Integrated College in Omagh to increase pupil numbers. In response to the judgment, Mr O’Dowd said he wanted to make it clear that he takes seriously his duties on this issue. •	Atlantic Philanthropies is one of the organisations that has previously funded The Detail.